The Philadelphia Union is the newest club to join Major League Soccer - the 16th team in the top soccer league of the United States. We're proud to introduce, the aididas Philadelphia Union 10/11 Home Authentic Soccer Jersey! 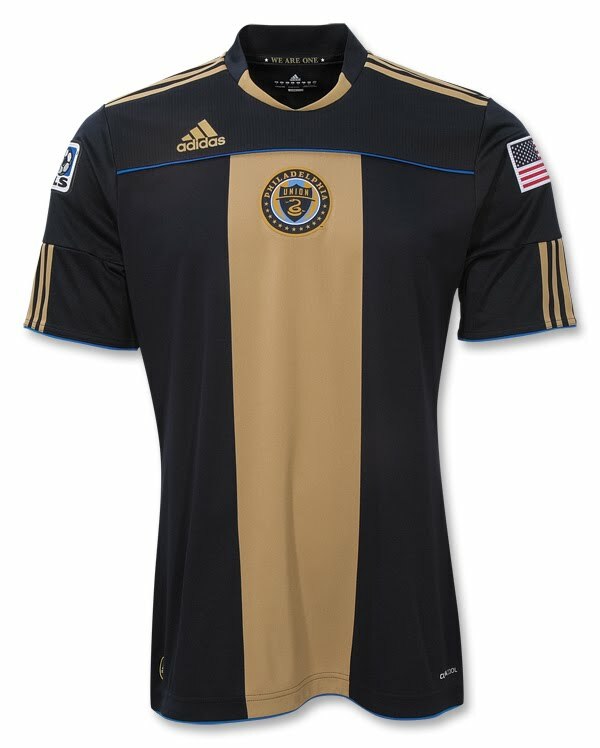 The official jersey, like the crest, incorporates the colors – midnight blue, with light blue (of the flag of Philadelphia) on top and bottom of the jersey, as well as the tip of each sleeve - of the Revolutionary Army and is a salute to the Club's fans and the history of the Greater Philadelphia Region. The embroidered club crest is centered on the front on a wide panel of Union gold; above the right breast: the adidas logo, maker of all official Philadelphia Union gear; on the right sleeve: an MLS patch; on the left sleeve: an American flag; back of collar: “Jungite Aut Perite”, Latin for Join or Die, Benjamin Franklin’s rallying cry for colonial unity. As with adidas' big teams, it is made with adidas ClimaCool® - advanced material engineered to reduce heat and moisture build-up, allowing increased comfort and performance – to keep you feeling fresh no matter how long you play, train and cheer on your Zolos! In 2007, the Sons of Ben supporter group formed and began advocating for Major League Soccer to grant Philadelphia an expansion team. They are credited with convincing the league that the area already had an established soccer fan-base. Major League Soccer added Philadelphia as its sixteenth team on February 28, 2008. The finalization of the club is the result of a $47 million package approved by Delaware County politicians and Pennsylvania governor, Ed Rendell, that includes the cost of Union Field and a major urban renewal project. Keystone Sports & Entertainment's plan for Chester was initiated in late 2006, soon after the New Jersey legislature terminated an earlier proposal for a soccer-specific stadium at Rowan University. On May 11, 2009, "Philadelphia Union" was officially announced as the team's name during a ceremony held at Philadelphia's City Hall. This name alludes to the Union of the Thirteen Colonies, of which Philadelphia was the first capital. The team's name was chosen following a fan poll held between January 19, 2009 and February 6, 2009. Before the Union moniker, the Sons of Ben nicknamed the team as the "Zolos." At a "Meet-the-Owners" event held two days before the expansion press conference in Chester, they wore nametags with handwritten numbers intended to read "2010." The number was mistakenly interpreted as "ZOLO" by ownership group member, Nick Sakiewicz. This led to Philadelphia Union being referred to as the "Zolos" in a series of inside jokes by the group.